I started with Griffin Printing, Sacramento/Burbank, CA in 1989 where I helped customers with their book printing needs for 9 years. I was the Director of Business Development for Bertelsmann Services, Valencia, CA for 6 years and I was under a consulting contract with Media Lithographics, City of Commerce, CA for 1 year. Currently, I work as an independent contractor (NOT A BROKER) with 3 U.S. book printers and 1 Offshore printer helping publishers print books in both short-run and long run, via digital or traditional offset printing. With more than 28 years in the business, and considered a technical book manufacturing expert, I use my expertise to help clients make savvy print-buying decisions and I’m also a publishing Consultant (Book Shepherd). I hit the road in 1991 for my first Publishing Conference as an exhibitor, at the time representing Griffin Printing. Over the next 15+ years I would find myself exhibiting at 15-18 conferences/year representing various printers and speaking on panels. I have been a Keynote Speaker as well as a Voice of Experience. In those wonderful 15+ years, I became very well acquainted with all of the Book Manufacturers across the country and overseas. In turn, this expanded my knowledge of the various types of printing /equipment available. When I chose to leave the Corporate world and go out on my own in 2003, I aligned myself with the Book Printers that I felt could provide me with the best products at the best price as well as provide the high level of customer service that I require for my clients. Since the printers have a variety of presses, binderies and capabilities, I have the ability to place jobs at the right plant, whether you have a book, manual, catalog, directory or coffee table book. I served four years as the Vice President of the Arizona Book Publishers Association, 2008-2011. Prior to my career in book manufacturing, I worked in radio and print advertising. Both gave me the opportunity to organize promotional events and exhibits. I was occasionally required to write/produce radio commercials and print ads for my customers. 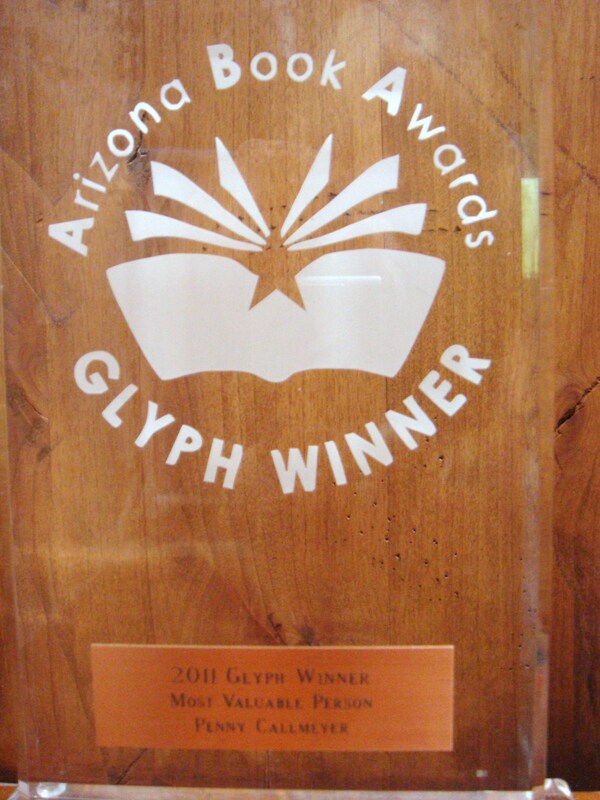 On Saturday, May 7th, 2011 the Arizona Book Publishers Association had their annual gala event at the Phoenix Country Club to present the 2011 Glyph Awards. I was very honored to receive the Most Valuable Person Award! Congrats to everyone, including the committees and volunteers that helped make this a smashing event! Member: Independent Book Publishers Association – Member: Northern California Publishers and Authors Association. Thanks Bev, I briefly looked at your web sites and blog, will look further over the weekend. You should contact Michael, I think you’d have a lot to talk about! Good suggestion…we would indeed have much to share. Thank you for your insightful suggestions Penny.